Can I use a shade structure for my business? Our commercial shade structures offer heavy-duty protection against harmful weather effects for your patrons and outdoor furniture. Constructed with heavy-duty steel and fade resistant materials that will stand the test of time in any playground, park, sporting facility, and school. The fabric shade canopy is crafted to be resistant to water, UV rays, hail, and withstand winds of up to 75 mph. 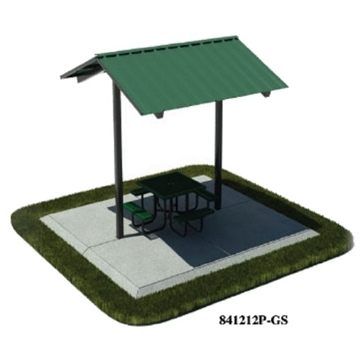 For areas where major storms and blizzards are a concern, we offer shade structures Choose your desired frame shape and size, made available in a large array of unique colors such as lagoon blue, terracotta, spring green, burgundy, Brandywine, and many more. Picnic Furniture's shade structures and sun canopies are proudly manufactured in the USA with a commercial warranty provided. There are many considerations when looking to purchase a shade structure for your business. The first question is, who is going to install it? We provide a set of installation directions to help either a contractor or maintenance team to set up the shade structure. Many cities require shade structures to be able to withstand a certain about of mph, so call our friendly staff for assistance on your cities requirements.